Do you ever get that feeling that you are being watched? I imagine that is what the ospreys at the nesting platform at the Virginia Institute of Marine Science (VIMS) must feel, if they notice at all. 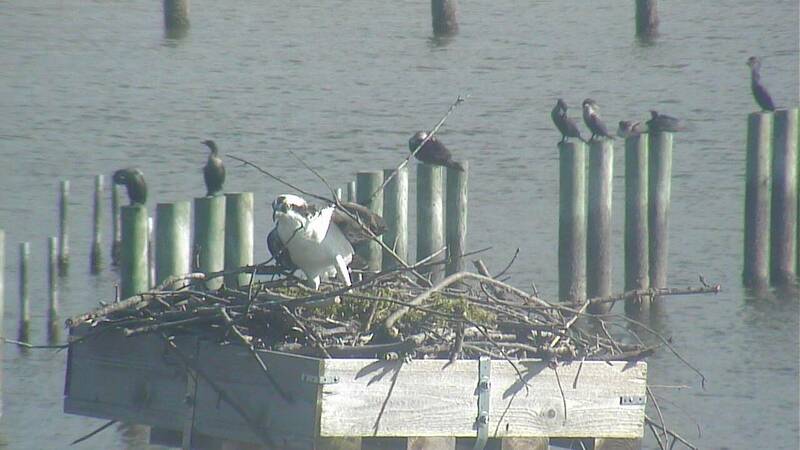 These birds have a camera that is trained on their nest 24/7 during the osprey breeding season (generally from mid-March to October). Ospreys are unique among North American raptors for their diet of live fish and ability to dive into the water to catch them. As a result of their life history strategies, osprey nests occur around nearly any body of water: saltmarshes, rivers, ponds, reservoirs, estuaries, and even coral reefs. The placement of OspreyCam at VIMS provides us with an around-the-clock window into the world and “family” dynamics of these amazing birds. We are able to watch as a mating pair cohabit their nest and use it to rear their young. As you can imagine, once the chickies hatch, things get quite interesting in the osprey nest! Checkout the addictive live feed below, and happy FSF! !